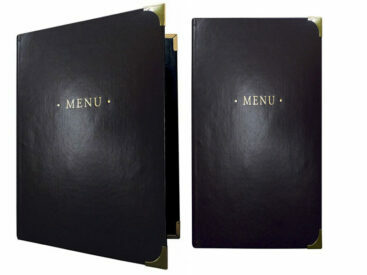 Get the leather look and durability with Mondo Menu Covers they are 100% guaranteed to get your restaurant noticed. Mondo Menu covers feature an internal hinge mechanism so you can add any number of PVC pockets making this menu cover versatile. the Mondo menu covers will take form one page through to twenty five pages and still look great. Mondo menu covers will work well for main menu cover. Enjoy the look and durability of leather with Mondo Menu covers, print your menus in house (save time and money)! Mondo Menu covers are extremely durable and a guaranteed to last the test of time. Mondo Menu covers are made from the finest bycast leather (just like your couch) and you can add any number of heavy weight PVC pockets. SKU: Mondo sample. Category: Samples. Tag: productSample.